(by Noell Wolfgram Evans) You may not be aware of the first time that you encountered William Hanna or one of his many cartoons. Chances are that it was a Saturday morning and you were probably curled up on the couch with a big bowl of Trix. Or maybe it was a Wednesday afternoon and you were sprawled on the floor, relaxing from a hard day of school when The Flintstones, The Smurfs, Yogi Bear, The Shirt Tales, Scooby-Doo or any number of other multicolored characters ran across your TV screen. You may not have realized it at the time, but these cartoons, produced in part by William Hanna, would come to represent not only a certain form of entertainment, but they would also become markers of your youth. Such is the genius of William Hanna, one of the few entertainers whose work is not only entertaining and influential in it's own time, but also holds a timeless importance in influence and entertainment. Hanna was born in Melrose, New Mexico on July 10, 1910. His father was a construction engineer who moved the family from job to job before finally settling them in Los Angeles in 1919. Nearly immediately, William encountered one of his true loves: The Boy Scouts. He joined the new organization quickly and remained an active participant in it through his entire life. It was here where he also started down the path he was born to take. While assisting his father with the construction of the Pantages Theatre, he learned that Warner Brothers was going to be starting an animation division. With strong natural talents and no formal training, he went looking for work. He landed himself a job and rose quickly through the studio; he was soon putting in time as the head of the Ink and Paint Department. Hanna continued to work and grow and in the mid-1930's, he found himself in the position of director in the animation unit at MGM (his directorial debut was 'To Spring' in 1936). At this point, MGM had been 'outsourcing' their animated films but in 1937, they decided to bring their production directly under the MGM roof. One of the first people they hired was Bill Hanna who was given the position of Director of Animation. He, of course, needed people to direct, so MGM went looking for animators. It is here where Joe Barbera steps into the picture. Barbera and Hanna 'latched on' to each other early on. The two of them couldn't have been any more different, but it might be safe to say that each man saw his own potential in the other. With his partner Joe Barbera, William Hanna won seven Academy Awards, and eight Emmys (including the prestigious Governors Award). They've won Golden Globes, Annies, several environmental awards (for various series episodes), received a star on the Hollywood Walk of Fame and been the recipients of numerous other accolades on their way to being inducted into the Television Academy of Arts and Sciences Hall of Fame in 1993. The pairing of William Hanna and Joseph Barbera was a serendipitous event and one that seems to have been determined to happen years before. Their strengths complimented their weaknesses and their personalities meshed perfectly. Barbera had a certain skill with the drawing board while Hanna had an innate knack for timing and gags, pieces crucial to the success of a cartoon. The two worked together at MGM for over 20 years, reaching successes unknown outside of Disney (The once won four Academy Awards in a row.). The were a special partnership, producing not only great works of entertainment, but acting as an influence to other animators, both in and out of MGM's cartoon division. In 1956, the partners were placed in charge of the entire animation unit at MGM. It was to be a promotion that was short lived as in 1957 the animation division was closed. During a partnership that spanned over sixty years of film and television, Hanna and Barbera worked with over 2,000 animated characters. 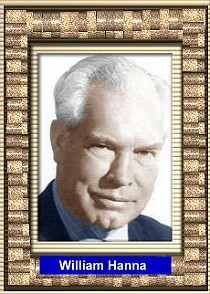 William Hanna was one of the first animation producers (and definitely one of the biggest animation 'names') to embrace television as a viable outlet for his trade. After the closing of the MGM studio, Hanna had to search for an outlet for his creative talents. One day he had a chance meeting with Jay Ward. Ward was looking to revive his 'Crusader Rabbit' TV series (which had been the first animated program on television). Hanna saw this as a great way to get his fingers into television and he agreed to take on the job, forming Shield Productions to handle the work. Just as they started though, the project stalled out. Hanna was energized by what he saw and did during the short time he was in production. With a renewed interest in animation, he contacted his old partner Joe Barbera with the idea of going into television. The decision of that conversation was a decision that changed an industry. They formed Hanna-Barbera Productions and in 1957, using many of the former Shield staff artists put 'Ruff and Reddy' on the air. At this moment Hanna-Barbera became television animation. There would be high and low marks but they would go on to set a consistent mark of entertainment right up through today. and The Completely Mental Misadventures of Ed Grimley among others. William Hanna is one of the few entertainers in the world who will live on, in work and influence for years to come. On March 22, 2001 Mr. Hanna passed away at his home in North Hollywood, California. He is survived by his wife Violet and his friends Yogi Bear, Magilla Gorilla, George Jetson, Huckleberry Hound, Barney Rubble, Snagglepuss, The Banana Splits, Penelope Pitstop, Kwicky Koala, Foofer, Fred Flintstone, Hong Kong Phooey, Space Ghost, Johnny Quest, Tom and Jerry. Noell Wolfgram Evans is a freelance writer who lives in Columbus, Ohio. He has written for the Internet, print and had several plays produced. He enjoys the study of animation and laughs over cartoons with his wife and daughter.